Family owned and operated since the 1920s, Owen Orchards is an old-fashioned apple orchard and farm with U-Pick apple varieties, a farm store, and a cider mill. 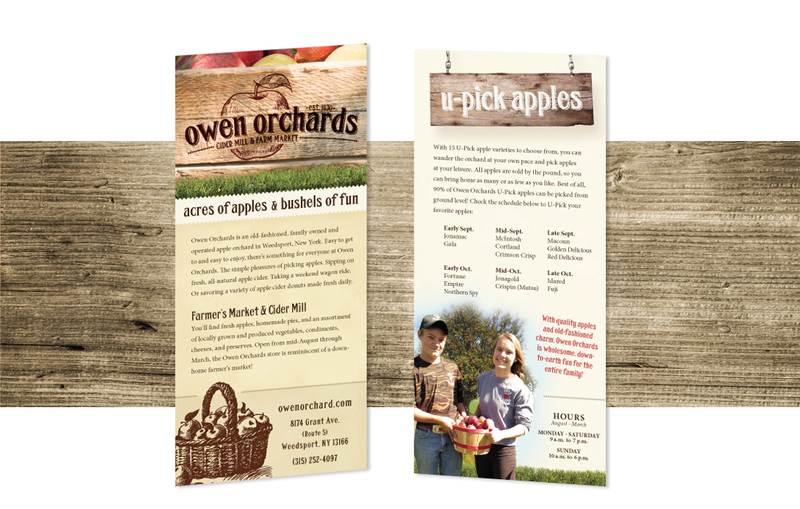 After redesigning their logo and website, Owen Orchards asked Crème della Crème Copywriting & Communication to also create a rack card to promote their business locally. Crème della Crème Copywriting & Communication consolidated the information from the website into a concise and brief rack card that features everything a visitor to the farm would need to know. The rack card highlights the hours of the Farmer’s Market & Cider Mill, as well as details when each variety of u-pick apples are season.